Our One Warm Coat drive is back and we have a goal of collecting over 150 coats for those in need! 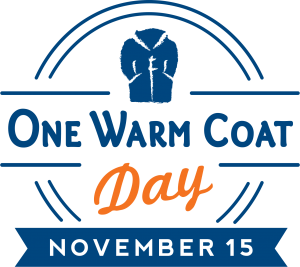 Did you know that for the nearly 15% of Americans living in poverty, a warm winter coat is in the “extra” column of their budget? You can help these individuals and families by donating new or gently used coats in children or adult sizes during regular office hours now until December 14th and help us reach our goal. These coats will go to local shelters for those who need warmth most. Join us and give the gift of warmth this holiday season!